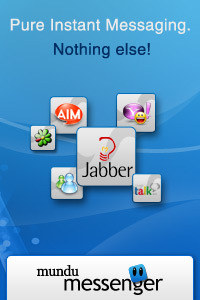 Mundu is mobile instant messenger like Talkonaut ,Migg33 , Nimbuzz ,Ebuddy , and Fring which support chatting over Google talk ,Jabber ,Yahoo messenger ,ICQ ,AIM in single application .Unlike others, Mundu mobile instant messenger is not a free application . It cost around 11$ for lifetime license and free upgrades , but a demo for 15 days is available . Download Mundu mobile instant messenger . Mundu messenger supports almost all mobile device like iPhone ,Android , Palm , Symbian ,Blackberry and Windows mobile . Full function messaging over Google talk , Yahoo , MSN Live and AIM messenger with support for smiley and special characters . Image and file transfer . Download Mundu messenger 4 Windows mobile,Android, Java SonyEricsson,Blackberry,Palm .